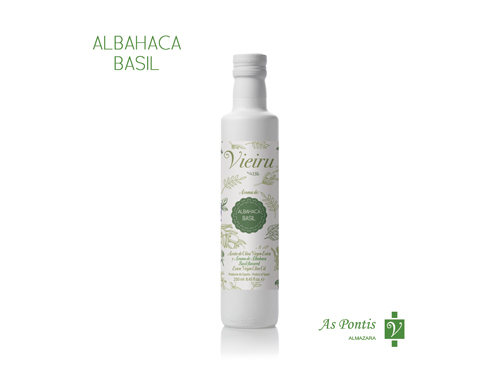 Flavoured extra virgin olive oil obtained through soaking of Extra Virgin Olive Oil ‘Vieiru’ 100% Manzanilla Cacereña olives and basil beans. Monovarietal Extra Virgin Olive Oil is slightly sweet, with great balance between bitterness and pungent. It is characterized by its fruity, being remarkable fruit notes to banana, apple, kiwi and green tomato. Besides, vegetable aromas such as artichoke or freshly cut grass. Very recommended for salads, fried food and toast.